Porsche going back to four cylinders? Porsche is in trouble. 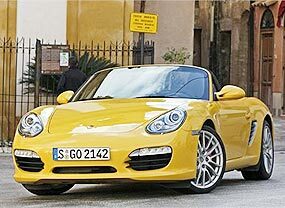 After failing to take control of VW, after taking out loans to finance the hoped-for purchase, it is now attempting to win the green vote by adopting a four-cylinder engine that could bring lower fuel economy and emissions for the Porsche Boxster and its hard-top sibling, the Cayman. This engine would be sourced from VW, and though not officially confirmed, it has not been officially denied. Leaked information suggests it is more than likely, backing up comments from a Porsche board member. Speaking at the launch of the Panorama - their four-door coupe that gives Porsche the biggest, most expansive (and expensive) model range ever - board member Klaus Berning hinted that more economical versions of the Boxster and Cayman were on the way. This is the company which flatly denied it would ever bring out a diesel, but this year released an oil-burning diesel Cayenne, the most ridiculous SUV ever made. That Porsche should fit a VW four cylinder is nothing new, with the early 356 and 912 series having VW fours. Later the 914, 924, 944 and 968 had four cylinder engines as well. Berning admitted the engine could be one shared with another brand, likely one sourced from the Volkswagen Group with which it has a technical collaboration. It would likely use a turbocharger as used on the Volkswagen Golf GTI and other vehicles from the Volkswagen/Audi family. The move would reduce fuel consumption and carbon dioxide emissions in line with Porsche’s push to reduce its environmental footprint. But do tree huggers buy Porsche’s, that’s the question left unanswered. Last week I asked what did the first Cooper 500 have to do with Fiat Topolino’s? I also said this was the start of the rear engine revolution. The gearbox, by the way, was a Triumph 500 cc motorcycle unit. Of course there were rear-engined racing cars before the Cooper, such as the Auto Unions pre war, but these were purely factory cars; you couldn’t buy one. The Cooper 500 you could. The engine for the first one was a speedway JAP, but the front and rear suspensions were made from the Topolino front suspensions. That was the connection. So to this week. A 24 liter 12 cylinder engine was used to garner several world speed records, with the cylinders arranged in three banks of four, known as a ‘broad arrow’ configuration. I want to know the engine, the car it was in, and the driver. 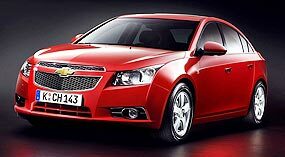 Chevrolet Cruze - coming to/from Thailand? The new Chevrolet Cruze may just work out to be GM’s answer in the current crisis. Built on the German Opel-designed Delta II front-wheel drive architecture it is generally thought of as a Korean vehicle, just like the Chevrolet Captiva. The car is almost 4.6 meters long, 1.8 m wide and 1.48 m tall, and has a 2685 mm wheelbase. It is not a small car, but best described as mid-sized. Those who have seen this vehicle all say that the styling is a little different, but it grows on you, and the interior is excellent. The body shell features triple-layered door seals, felt window inserts, extensive use of dampening material, and single-unit upper body structure and frame. The dashboard design is attractive, functional and well made. Recessed inside a chrome-trimmed binnacle is a set of instruments that are both smartly scripted (in cool Speed Racer-style font) and incredibly easy to read. They enclose a duo of dials (fuel and temperature) as well as an LED display for the odometer and trip computer readouts. They are all illuminated in a cool jade green. All the switches and controls on the dash and steering wheel are clearly marked, large enough to use without being an eyes-off-the-road distraction, and tactile in feel. The finish is just fantastic. There is class-competitive leg, knee and shoulder space for outboard occupants, door and front seatback map pockets, overhead grab handles, and a wide centre armrest with cup holders. Offering 400 liters, the boot is usefully large and adequately deep despite the existence of a full-sized (steel) spare wheel below a pitifully flimsy floor. It is also easy to load and unload thanks to a low lip and large aperture, and the 60/40 split fold seats lay flush with the boot floor for the benefit of longer items. The top of the line model includes six airbags, stability control, anti-lock brakes, Electronic Brake-force Distribution, traction control, collapsible pedals, cruise control, steering-wheel mounted audio controls, air-conditioning, power windows, remote central locking, auto-on headlights, six-speaker CD/MP3 audio, a trip computer, heated exterior mirrors and body colored exterior trim. The overseas testers are all suggesting the diesel version is the way to go, rather than the somewhat long in the tooth four cylinder 1.8 liter petrol. It packs a considerable 110 kW/320 Nm 2.0 liter turbo-diesel that is capable of delivering 6.8 L/100 km in six-speed auto guise. The thing is, though, the Cruze’s price tag does not come within a cooee of this sort of competition when you factor in feature for feature. Basically, you’re paying at least 10 percent more than some, and even the costlier CD Diesel version often manages to undercut several petrol rivals. The Australian version of the Cruze is apparently being directly sourced from Korea, but it would make more sense, with the Free Trade Agreement, to assemble them here. I am sure there would also be a domestic market for the Cruze in Thailand. After all, the sales of one tonne pick-ups and SUVs are depressed much more than smaller sedans. How about it GM, out there on the Eastern Seaboard? And you will be making the diesel engines there as well. Just what is happening in F1? Here is my take on the controversy, and why it happened. F1 is a peculiar sport in the fact that it is quite fragmented. The FIA has been setting the rules, and polices them under the direction of one man (Max Mosley). The commercial rights are owned by one man (Bernie the greedy garden gnome Ecclestone) and the teams have to toe the line to get money from the holder of the commercial rights income. To attempt to redress this nexus, the 10 teams banded together in September 2008 to provide one voice under the umbrella of FOTA (Formula One Teams Association). Simmering with discontent at their slice of the financial pie, FOTA began to put pressure on the FIA and the commercial rights holder and battle lines were drawn. 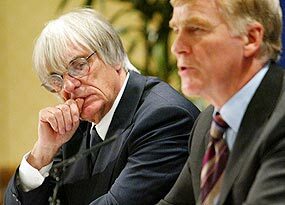 Under the general heading of cost cutting, the FIA (read Mosley) unilaterally stated that the 2010 rules would introduce measures to cap the costs, and that teams which agreed to a cost cap of 40 million Sterling would have greater technical freedoms than those who did not agree. This would include unlimited engines, aerodynamic freedoms and testing. Those who did not agree to the cost cap would get no testing during the year and other restrictions. These proposals would of course produce a two tier championship - the cost capped and the free spenders. FOTA immediately objected saying how could there be the pinnacle of motor sport with two groups/tiers? The FIA returned by telling the teams they had to enter by June 12, or they were out of the championship anyway. However, the FIA (Mosley) did say, that if the teams did enter, agreeing to the new rules, then changes to those rules could be agreed upon later. This is similar to the Big Bad Wolf suggesting that Little Red Riding Hood come into the kitchen to confer on the dinner menu, as for there to be any changes, ALL teams have to agree. Can you see that happening afterwards? No, neither could I. Neither could the teams, so they provided a ‘conditional’ entry, subject to 2010 running under the same rules as 2009. Returning to the cost capping, a footballer just changed teams for 80 million Sterling, and the FIA suggested that you could run a team on half that! In addition, whilst there were technological freedoms, it would cost much more than 40 million Sterling to design and test these freedoms. So cost capped teams were really getting very little. With governments world-wide promoting spending and injecting money to stimulate the economy, the very concept of restraining the teams’ spending would also not achieve much, other than putting many workers out of a job. Hardly stimulating the economy. And just by being a big spender does not automatically mean the race team becomes the big winner. Honda and Toyota are yet to win a championship, despite their big budgets. “These teams therefore have no alternative other than to commence the preparation for a new Championship which reflects the values of its participants and partners. This series will have transparent governance, one set of regulations, encourage more entrants and listen to the wishes of the fans, including offering lower prices for spectators worldwide, partners and other important stakeholders.” We all cheered! But the next step was the World Motor Sports Council (WMSC) meeting which thrashed out a compromise between the FIA (Mosley), Ecclestone and FOTA. However, remember that a compromise can never live long. A donkey is an entity, a mule is a compromise. Within 24 hours of Mosley saying he would retire and not seek re-election and FOTA saying they would then stay within the FIA, it was gloves off again and there are mutterings of a breakaway series yet again. Quite frankly, your guess is as good as mine at this juncture, but I expect that by the time we have come to the German GP in one week’s time, FOTA will have given up their alternate championship, which will be a shame. The ‘good’ circuits such as Silverstone have to be maintained (300,000 spectators over the race weekend) whilst the ‘bad’ circuits such as the dreadfully boring Valencia should be dropped. Stay tuned.